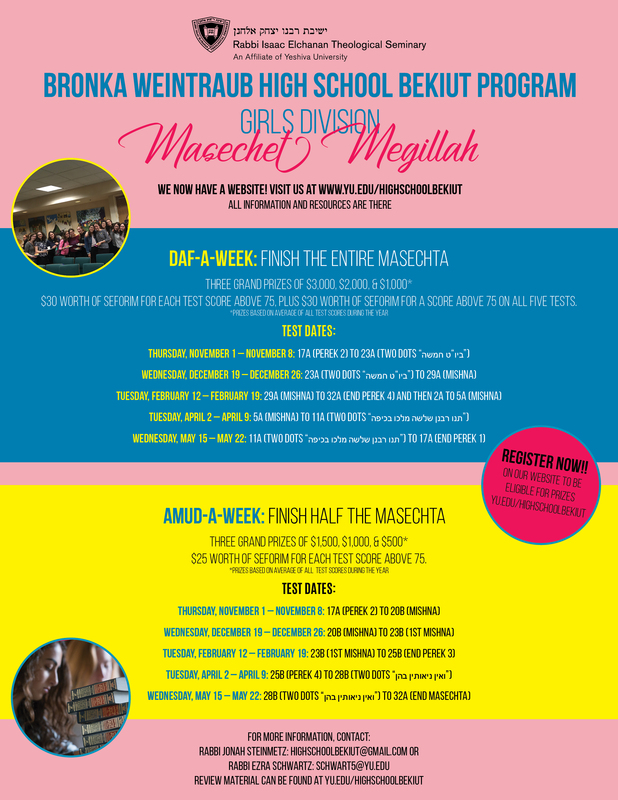 The Bronka Weintraub High School Bekiut program is an extra-curricular opportunity for students to advance their learning of Gemara. 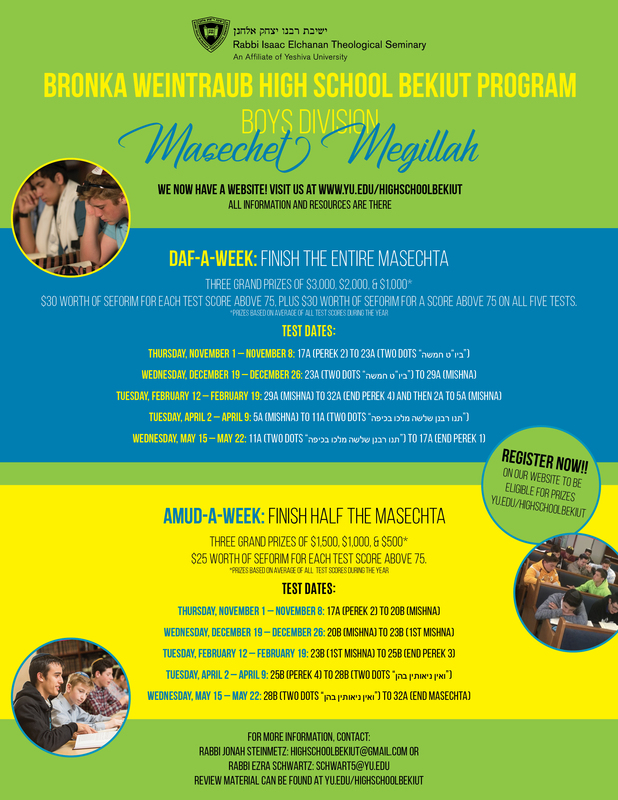 Students prepare full or half masechtot - depending on if they are in the "Daf-A-Week" program or the "Amud-A-Week" program - over the course of the school year. Students learn with a class, a tutor, a friend, videos we provide online (at YUTorah.org) and then take five challenging tests during the year which allow them to display their level of mastery of the material. If a student does well on a test he/she receives money towards seforim from Eichler's Judaica. They can earn up to 180 dollars over the year. The top three students in every program receive grand prizes of up to $3,000 each. This program is providing an organized context for motivated high school students to take their Torah learning to the next level. We provide inspiring content and an enjoyable framework in which a student can appreciate learning, concomitantly gaining a tangible sense of their success therein. Students graduate the program inspired and ready to grow even more. Students who perform well on their bechinos will receive prizes in the form of credit enabling them to purchase sefarim at the year’s end. Every member of the daf per week program will earn $30 in credit towards sefarim for each exam that he or she achieves the score of 75 or higher. Should a member of the daf per week program accomplish this feat on all of his or her tests, he or she will receive an additional $30 bonus, for a total of $180. Every member of the amud per week program will earn $25 in credit towards sefarim for each exam that he or she achieves the score of 75 or higher. However, there is no bonus for maintaining this score across all of the amud per week exams. Each student who successfully completes his or her program will receive a certificate describing his or her accomplishments. Upon the end of the program, we will announce the grand prize, second prize, and third prize winners in each track. In the daf per week program, the three students with the highest average scores on the five exams will respectively receive $3,000, $2,000, and $1,000 in cash prizes. In the amud per week program, the three students with the highest average scores on the five exams will respectively receive $1,500, $1,000, and $500 in cash prizes. There will be separate prizes for the boys’ and girls’ divisions. We can be contacted at highschoolbekiut@gmail.com. Please feel free to speak to us if you have any questions or comments. We look forward to partnering with you in a year of increased Limud HaTorah Ve-ahavatah!